harmonic to the eclipse cycle. about the nature of events. This morning's spike high was on Mercury/Chiron flux- Chiron squares Saturn opposing Neptune in the NYSE chart. the NYSE than a particular stock or index. 8/10/2007 1:45:14 PM Mountain TG:: I just started reading a book about traders and successful strategies called "Way of the Turtle" by Curtis Faith. 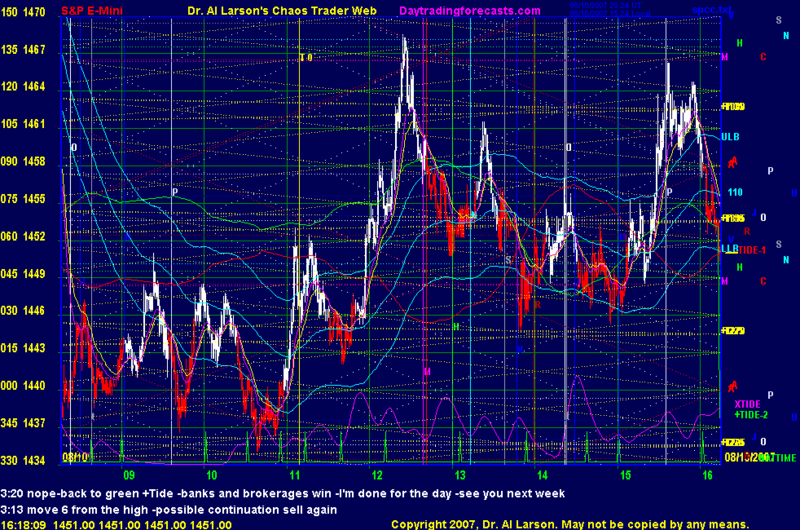 His example of a trending and volatile market is a CCS the way Al sketches them out free hand. Shows 7 moves in his example not E-wave 5. Thought that was kind of cool. 8/10/2007 1:32:01 PM Mountain TG:: There's definitely a fine balance between patience and stubbornness. Yesterday, I had a few small gains, kept getting whipsawed. Late so selloff setting up and got in too far from 110 and lost days profit. I usually don't take trades after 3:30 but took one last one at about 5 minutes before 4 and rode it down for 8 pts. I don't know if that was patience or stubbornness. 8/10/2007 1:21:48 PM Mountain TG:: Right Al, usually 6 pts of noise, sometimes 10 pts in last 2 days. Anyway, was starting to find support on a key CTME up streak so decided to lock in a few pts just above last few wicks. Also had 7 nice moves in 20 exma with lower lows but price was just hanging around and not following new lows in 20 exma. 8/10/2007 12:55:08 PM Mountain TG:: Ok stop to 54. 8/10/2007 12:33:11 PM Mountain TG:: raising stop to 58.5. Last two days made 16 pts and would have been a lot more if not for wild whipsaws. Will give it the room it needs and if it takes me out for 5 here so be it. 8/10/2007 12:31:59 PM Mountain DBJ:: Resold 52, "once again into the breach"
8/10/2007 9:08:11 AM Mountain TG:: Looks like move 4 underway on 3-day fractal. 8/10/2007 8:47:04 AM Mountain gdl:: any shorts?